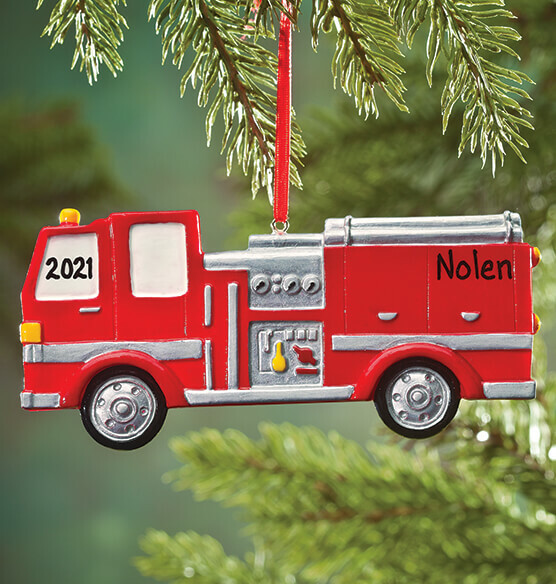 Rescuing Christmas with a super-fun gift, this brilliant personalized fire truck ornament arrives on the scene personalized to please! Wonderfully detailed, it’s a perfect gift for kids of all ages, from future firefighters to real-life heroes. We’ll personalize. Specify name; limit 1 line, 10 letters/spaces. Specify year; limit 4 characters. Resin. Personalized Christmas ornament measures 5" wide x 2 1/2" high. I bought this for my 2 year old grandson who wants trucks for Christmas. He proudly hung it on the tree and was very excited to have his own ornament, personalized with his name and year on it. It's a very nicely done piece. Cute ornament for a little boy. Nice size ornament and a good price. I would buy this product again because it is cute ornament . I have bought these ornaments before and know what a good product they are. Will not order from here again. Not as cute as the picture.